Click on the photos to see them in a larger view and then hit the back button to return!! 13¼" Long x 10½" Wide x 11½" High w/o handles. 10"Wide x 7" Deep x 5" High without handle and 11½" High with handle. 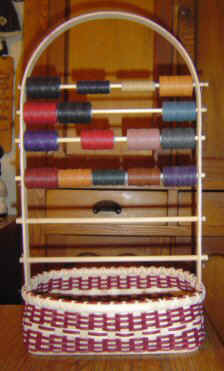 Pattern uses a 10" x16" EZ Weave Handle. This pattern requires a divided EZ Organizer II base and hoop. 5" Diameter x 3¾" without lid and 4" with lid. Base with Acrylic jar and lid are available on our Round Bases page. This pattern requires a special rectangular base with wrought iron handle, acrylic poker chip holder and beads. 4"x9" flat-sided (racetrack) oval base. 10½" High with the handle. This pattern requires a 4" round base with a 6x10 'D' handle attached. This pattern requires an 8½" x 14¼" Oval base and heavy duty acrylic liner. This pattern requires a 4" x 9" rectangular base. 8½" High with the handle. 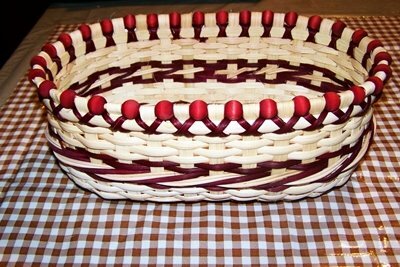 This pattern requires a 5"x8" flat-sided (racetrack) oval base with a 6" spread, push-in handle. 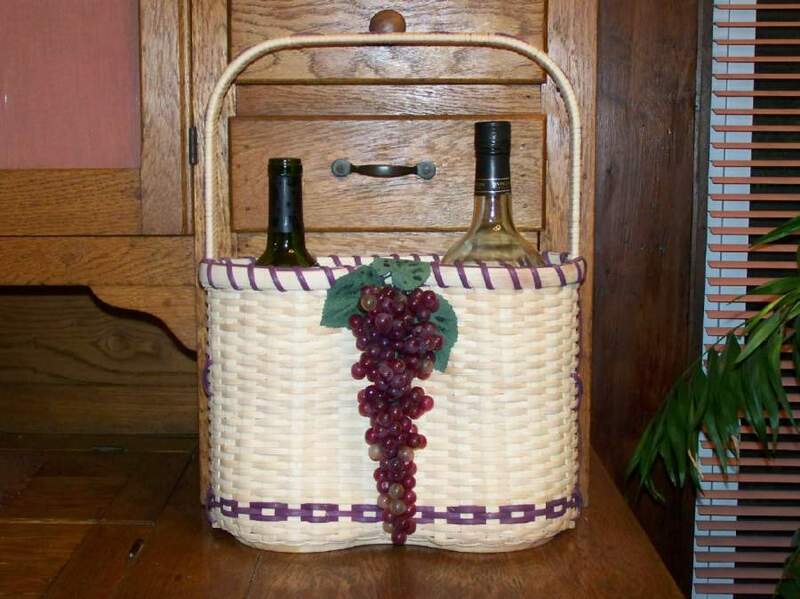 This basket requires a 4¼" x 8" flat-sided oval base with 5x14 'D' handle and large glass holder for red wine. 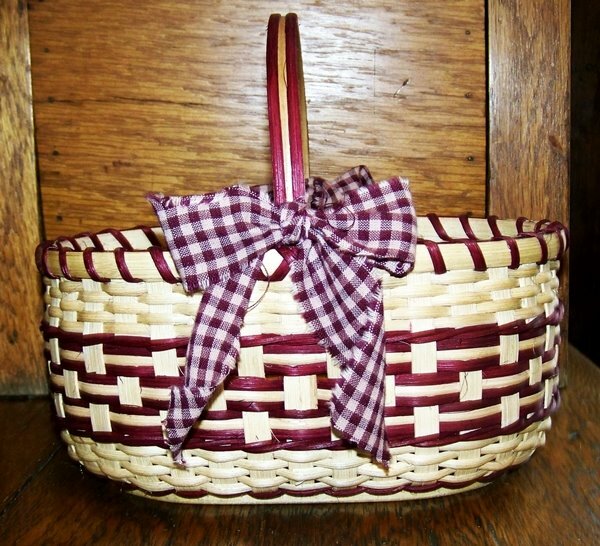 This basket requires a slotted wooden base with two swing handles, a rim and lid. This pattern requires a special base with dividers (designed by Dan Feix). 8½" Deep x 12" Long x 4½" High without handle and 10½" High with handle. 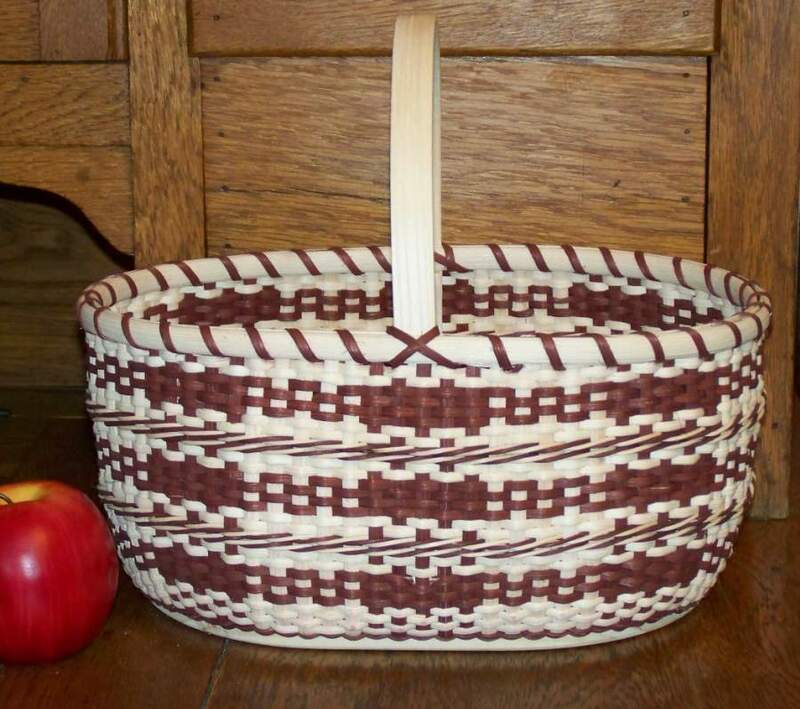 This pattern requires a 7" x 11" flat-sided oval base with an 8x10 Flat Top 'D' handle. 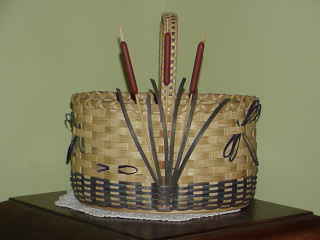 9" Diameter x 4⅞" High without handles and 7" high with Handles. 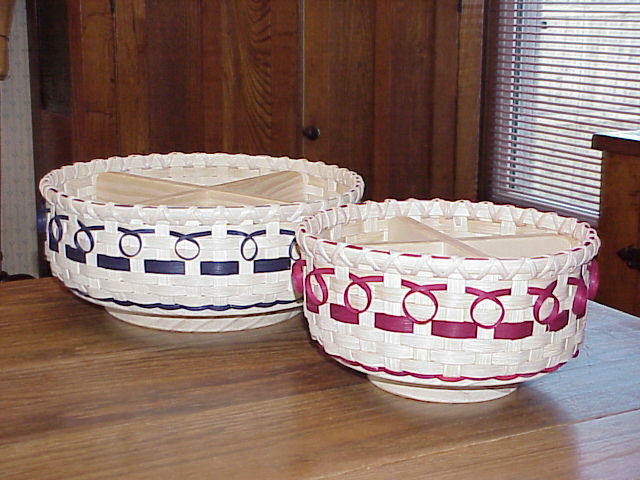 This pattern requires an 8" octagonal base and a pair of 3" spread, square-topped, bushel basket handles. The base is available on the Octagon Bases page. 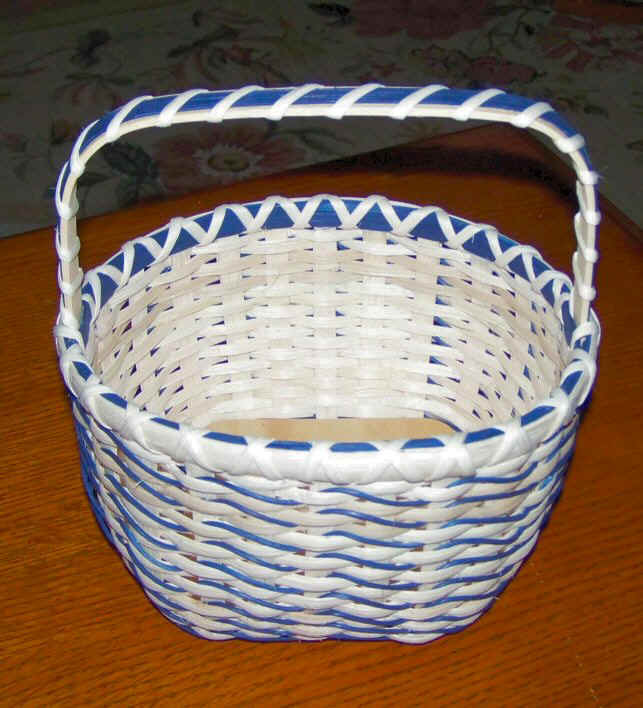 The handles are available on the Miscellaneous Basketry Items page. 11" L x 8¼" W x 6¼" H without handle & 8¼" H with handle. 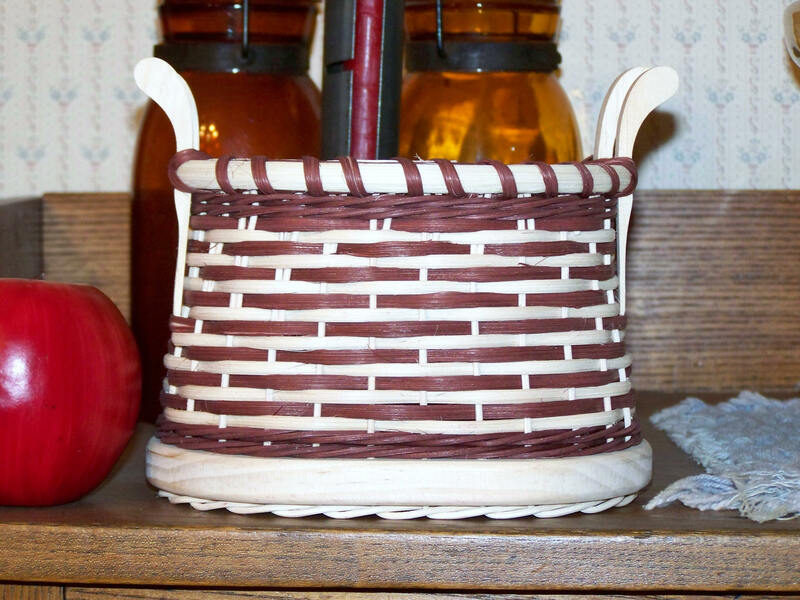 This pattern requires a slotted wood base with the handle/divider that was created by Dan Feix for the TLC basket. 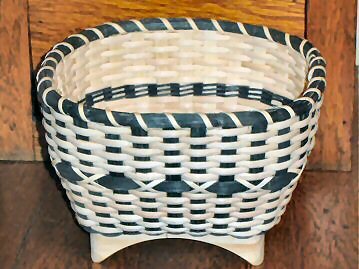 This pattern requires a 12" round slotted base and a pair of 5" square topped, bushel basket handles with a 5/8" slot to fit the rim. 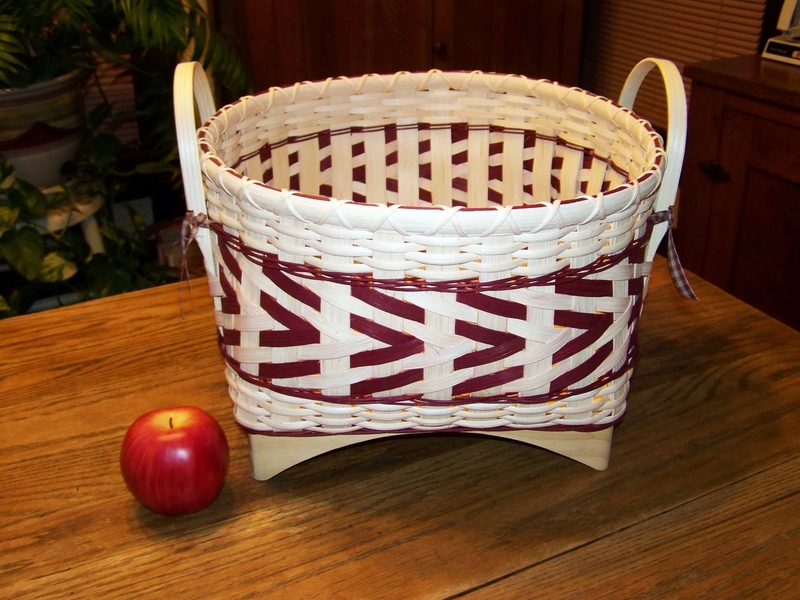 This pattern requires a 12" square, footed base and a pair of 4" Bushel Basket handles. This pattern requires a 5" x 7" flat-sided oval base with holes and a pair of 2" Dan-Dee© handles. 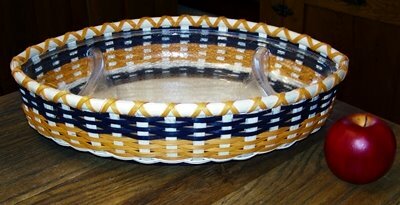 This pattern uses a 4"x6" flat-sided oval, slotted base. 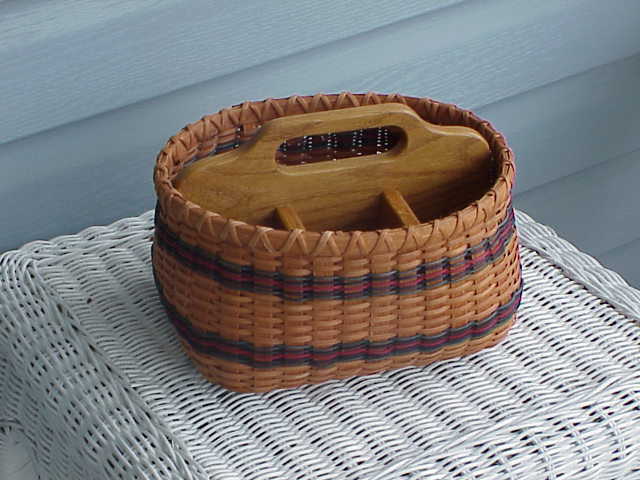 This pattern uses an 8" square, footed and slotted base and pair of 4" Dan-Dee handles. 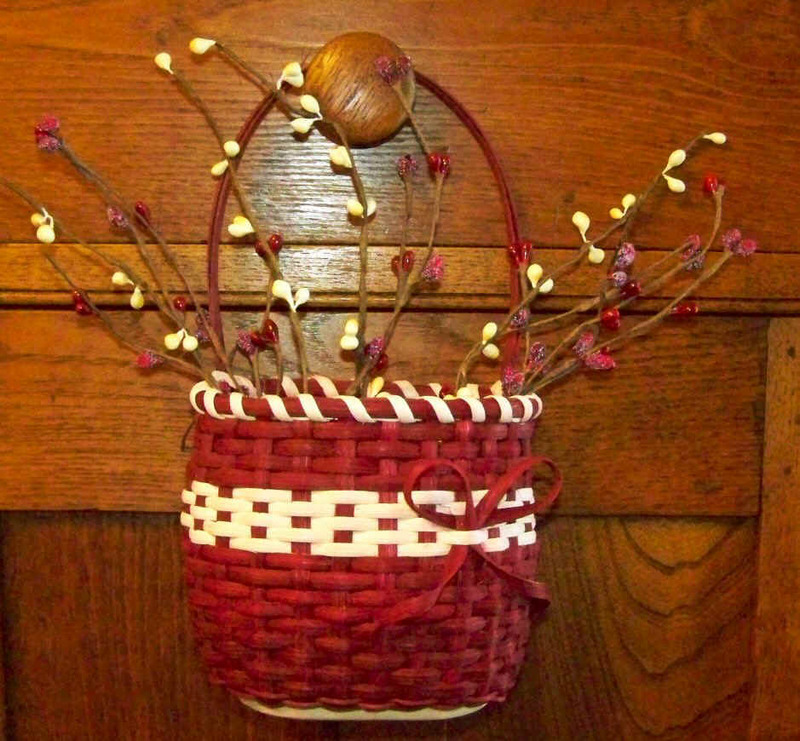 This pattern uses a 2½ x 4" flat-sided oval, slotted base, pair of mini leather handles and 2 mini cattails. 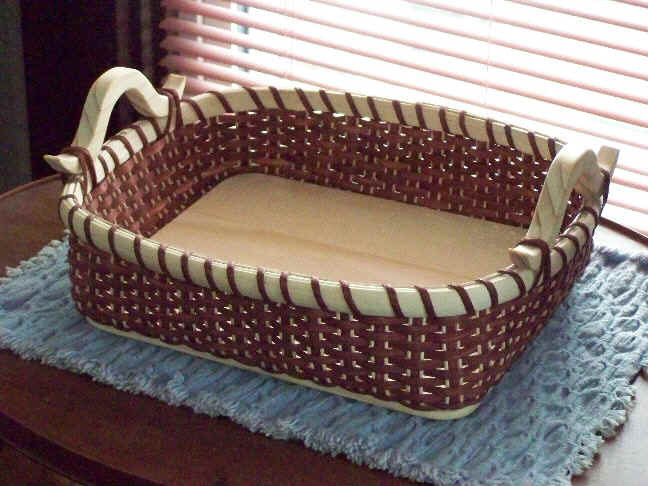 This basket uses a 4½" square, slotted base/lid with oval hole for tissues. 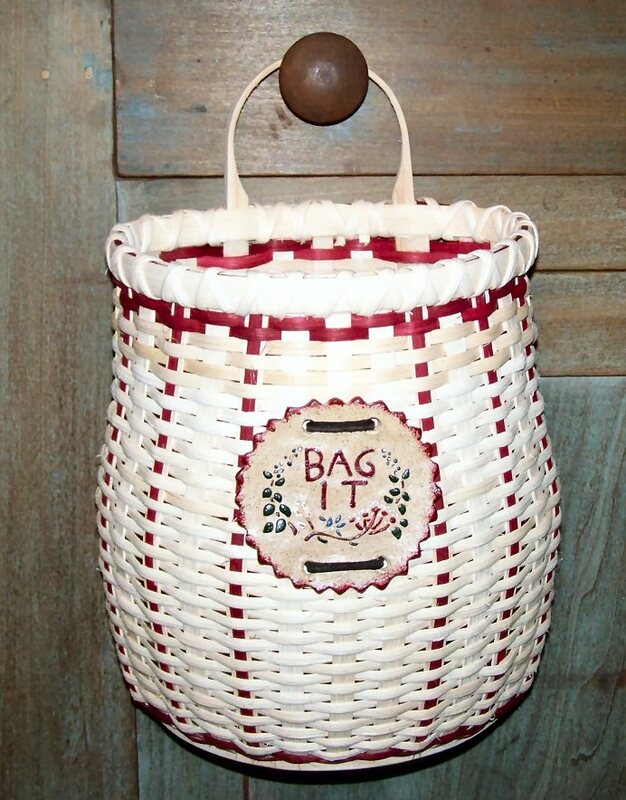 This pattern uses 10x16 flat-sided oval, slotted base and 11½" spread open-notched, push-in handle. This pattern uses 8"x12" rectangular, slotted base with an 10x13 Flat Top 'D' handle attached. 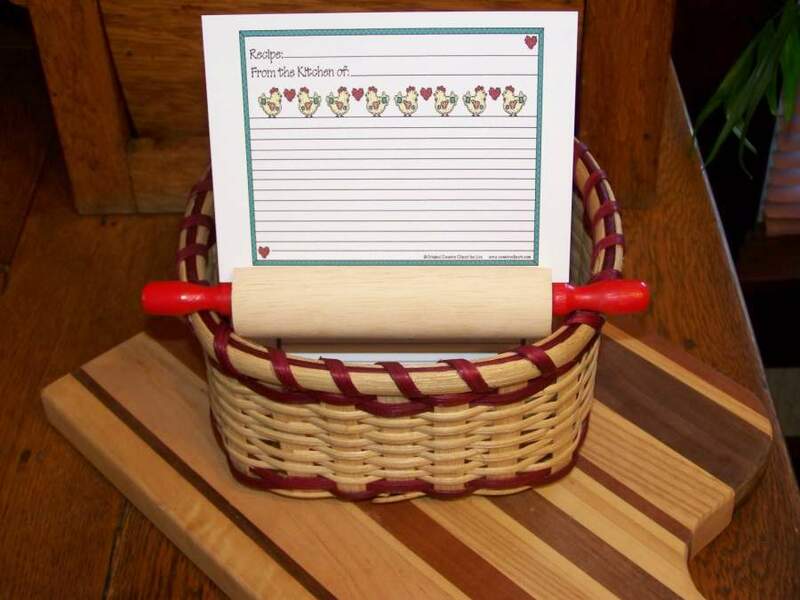 This pattern uses 4"x9½" rectangular, slotted base and pair of 2" Dan-Dee handles. 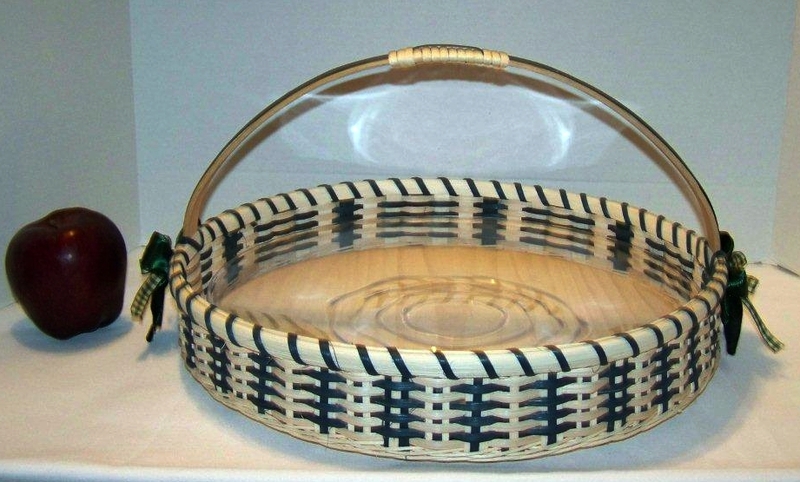 This pattern uses 7"x11" flat-sided oval base with an 8x10 Flat Top 'D' handle attached. This pattern uses 2"x3½" flat-sided oval, slotted base. 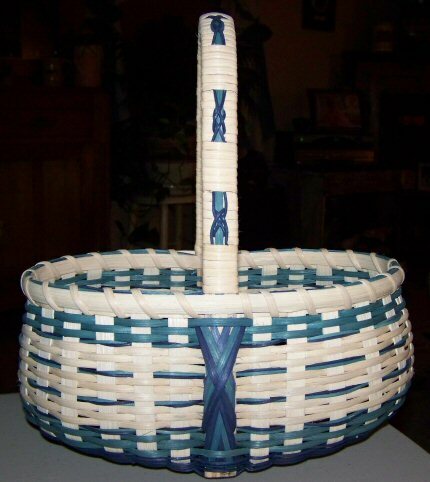 This pattern uses a 4" round base that is ATTACHED to a PVC pipe (stays inside completed basket), handle with screws and spacers, round hoop for inside rim and lid with knob. This pattern requires a 6" x 10" rectangular slotted base and a pair of 3" Dan-Dee Handles. 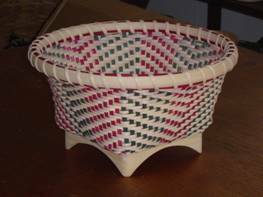 This pattern requires a base that is 1/2 of an 8" round with a large center hole and bushel basket handle and stoneware piece. 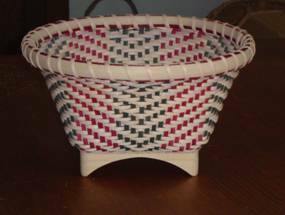 This basket uses a 5" square base with an 8" hoop/handle. 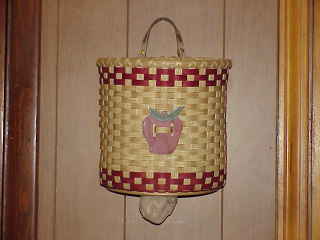 This basket uses a 7x11 flat-sided oval base with D handle attached. This pattern requires a peanut base with a handle attached. 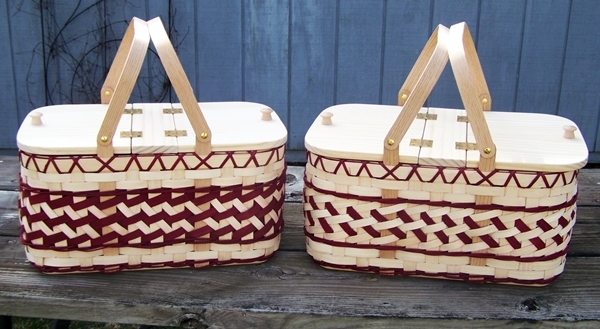 This pattern requires a 9" x 11" rectangular, slotted base, pine, with a pair of wavy handles. 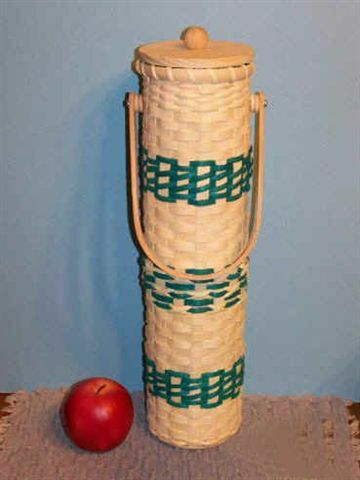 This pattern requires a peanut base with handle attached. 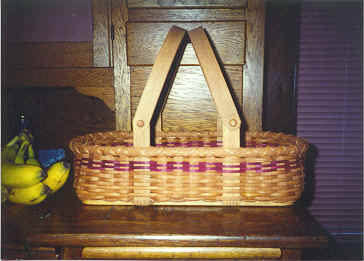 This basket requires a 5" x 8" oval, slotted base with handle attached. 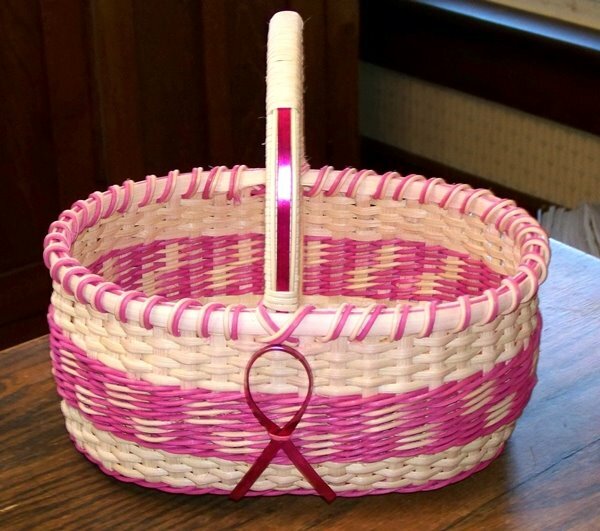 This basket requires a 9" round, slotted base with a 10x20 'D' handle attached. 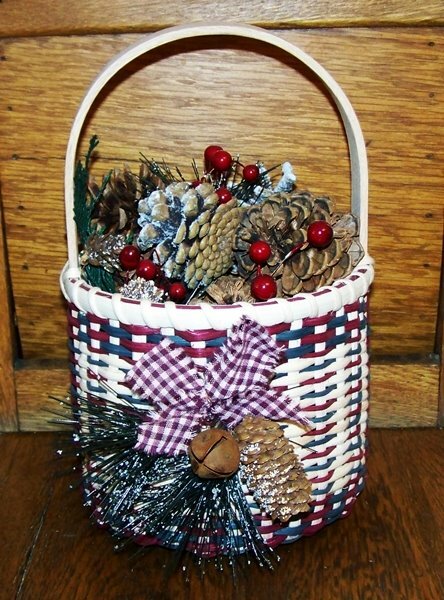 Dimensions: 7½" (with handles) x 4½" x 3¼"
This basket uses a 6" x 10" flat-sided oval, slotted base, pine, and an 10" round, open notched handle. 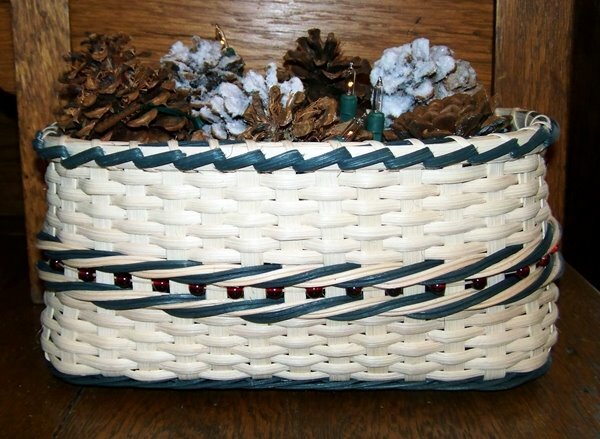 This basket uses a 4" x 9" tissue topper base/lid. 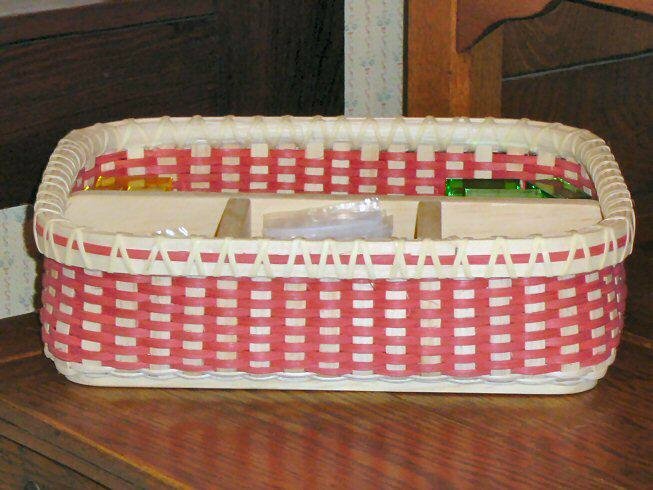 This basket uses a 12 x 16 flat-sided oval base with holes and a pair of 4" Dan-dee insert handles. 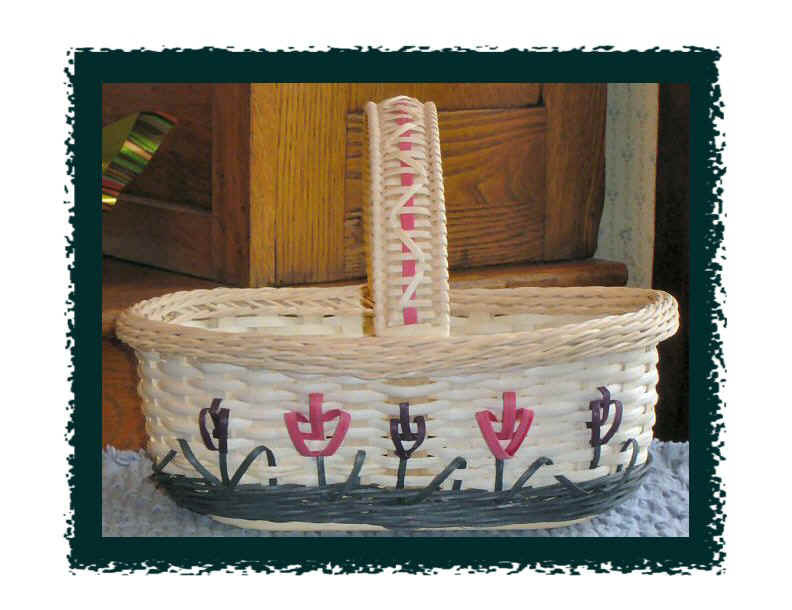 This basket uses an 8" x 10" flat-sided oval with a 10" spread, round, open-notched handle. 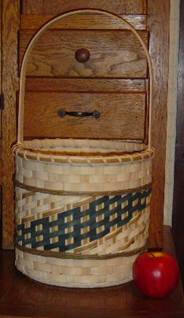 This baskets uses a 5x8 flat-sided oval, DOUBLE slotted base and a 6" round, open-notched, swing handle. 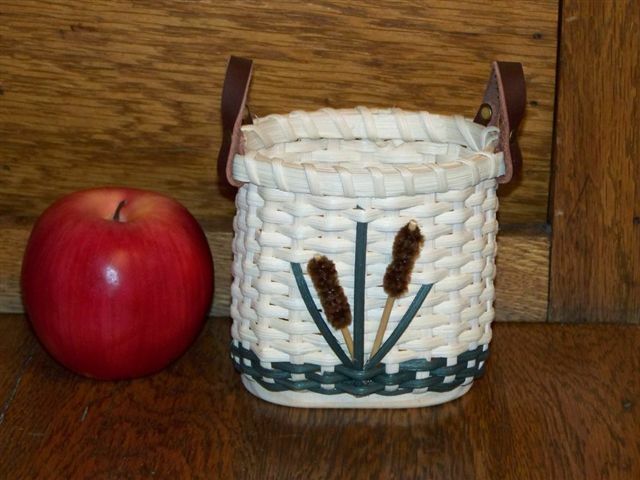 This basket requires the Simply Divided rectangular, slotted base with divider/handle. 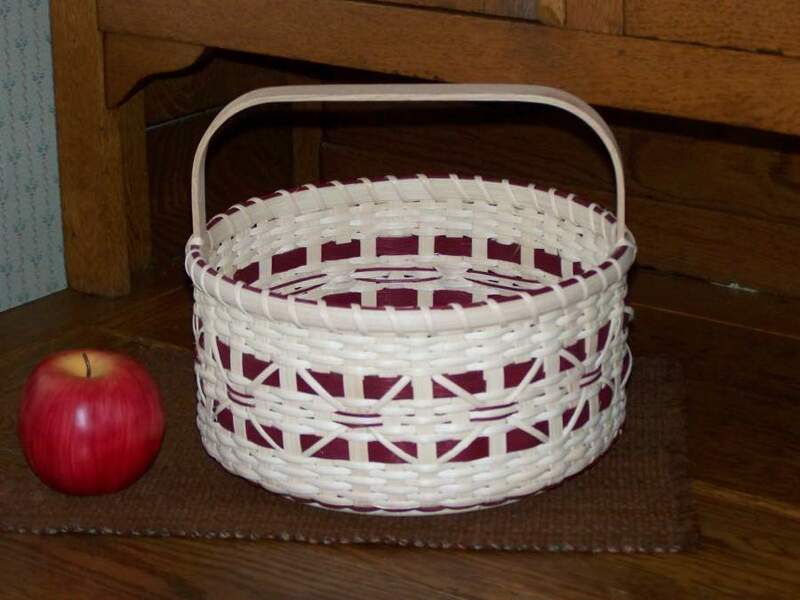 This basket requires 2½" x 2½" square slotted base, with 1" ball feet and 3" Williamsburg Handle. 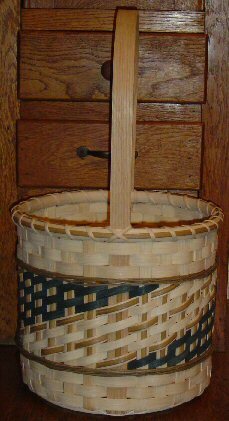 The basket also uses 3/32 dyed and natural black ash for weavers. 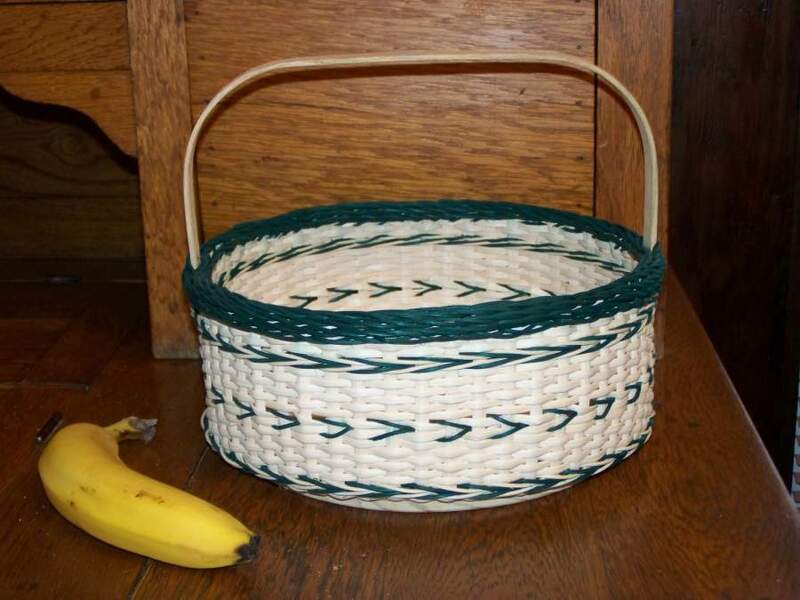 This basket uses a 4" x 9" flat-sided oval, slotted base with a 5" Williamsburg handle attached. This pattern requires a 5" x 11" rectangular slotted base, with specially designed feet ©2005 by Dan Feix, a pair of specially designed handles ©2005 by Dan Feix, and a 6x12 rectangular hoop. This pattern requires a 5" x 8" oval base, and a 6" spread square notched handle. This pattern requires a 5" x 8" oval, double slotted base. Finished Dimensions: 10" Wide x 12" Long x 22" Tall with handle and 3½" without handle. This pattern requires an 8" x 11" rectangular base with handle attached and drilled for dowels. 6 dowels and safety pins included. Base idea was by Karen Booth, of Homestead Heirlooms for her Waxed Linen display and created by Dan Feix. 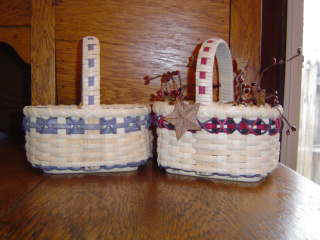 Basket designed by Pam Feix with permission from Karen Booth. Finished Dimensions: 6" wide at bottom x 12" wide at top x 6½" Tall x 30" circumference. This pattern requires a 6" square, double slotted, footed base DESIGNED by Dan Feix ©2005. 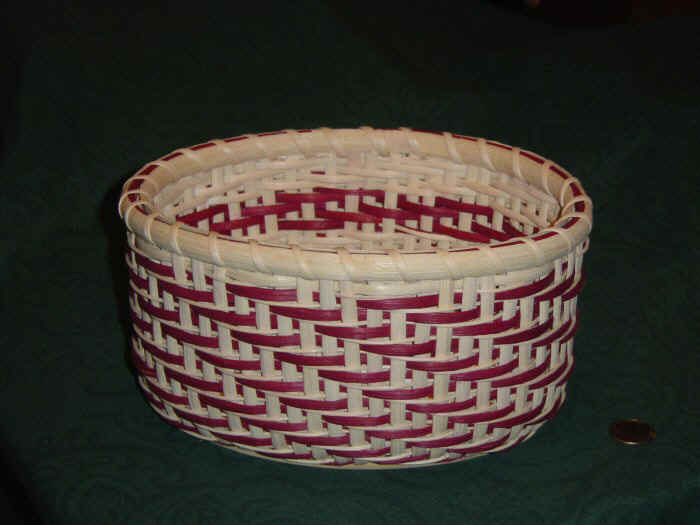 This pattern uses a 6" square, footed, DOUBLE slotted base, designed by Feix Family Baskets. 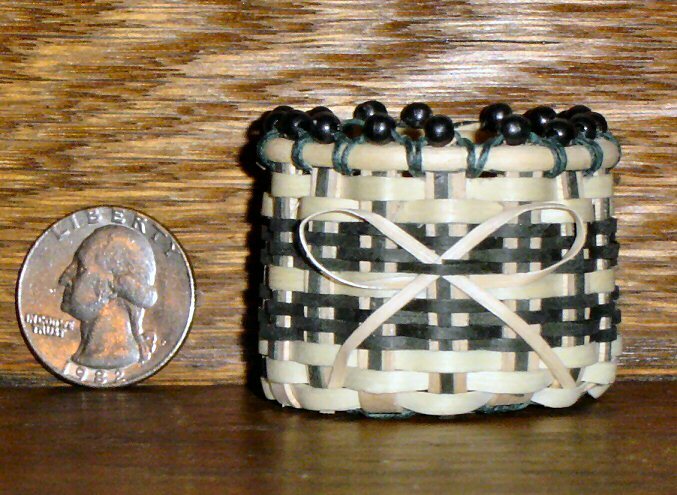 Finished Dimensions: 1¾" Diameter x 1½" Tall including beads. 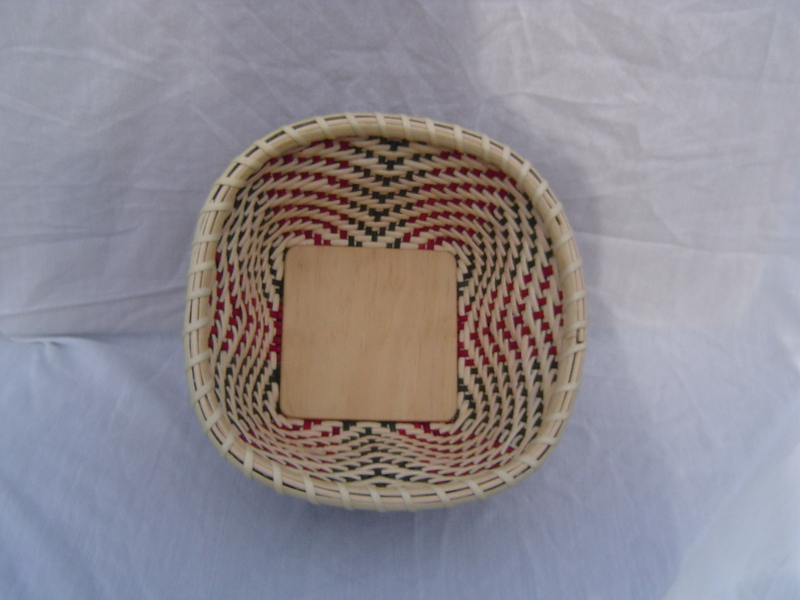 This basket requires a 4¾" round base, with holes. 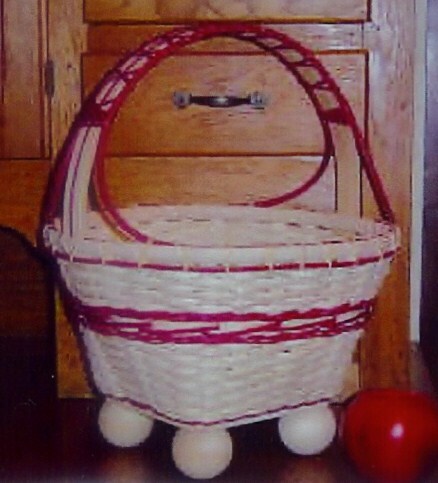 This basket pattern requires a 6" square base, with ball feet and Williamsburg Handle attached. 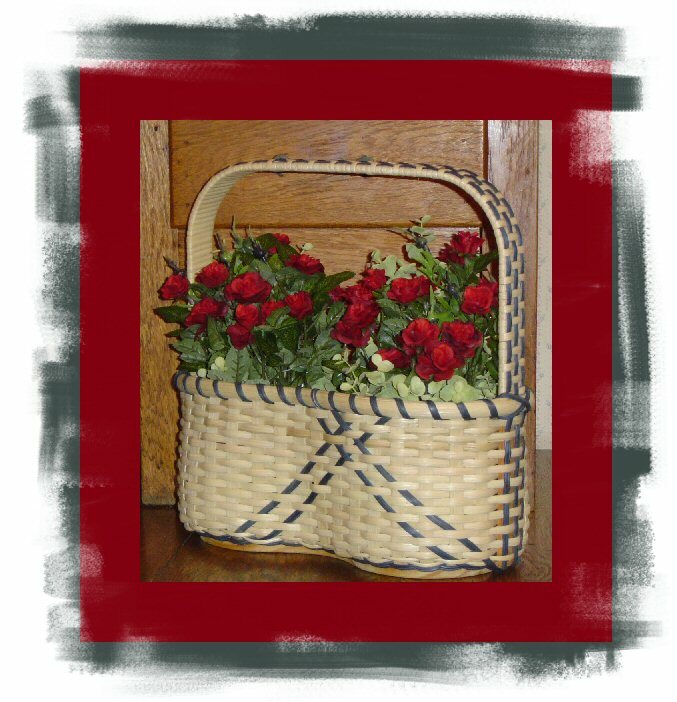 Dimensions: 11¾"x4½"x5½ w/o handle and 8½" tall with handle. 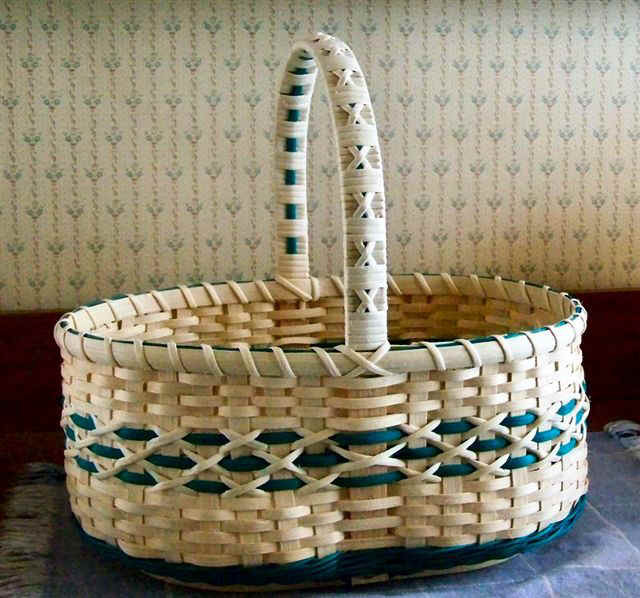 A wood bottom, slotted base with handle/divider is a new and unique design for an old type of basket! Available at this website in the miscellaneous bases category. This pattern requires a 7" hexagonal base with and 8x10 "D" handle attached. This pattern requires a 5" octagon base with a 6x8 "D" handle attached. 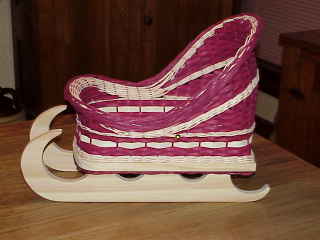 This pattern requires the Country Sleigh base!! 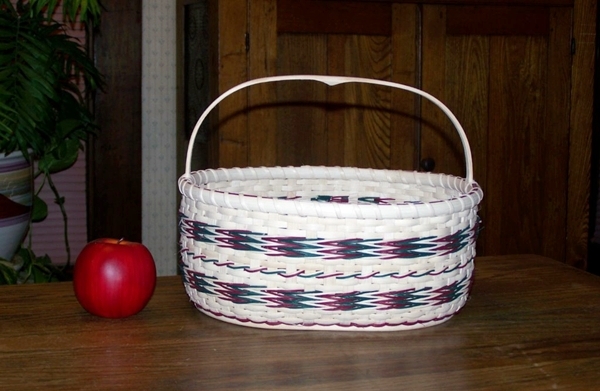 Dimensions: Base 10" x 13"
This pattern requires a 9 x 12 oval with handle attached. Cattails are included with the base/handle combination. Cattails NOT sold separately!! Base: 10" x 16"/Height: approx. 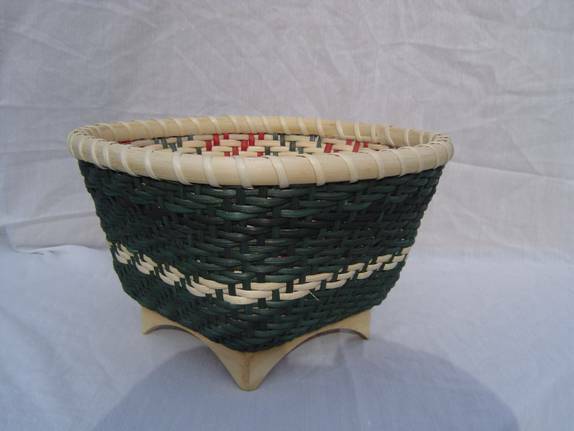 4½"
Base: 12" x 16"/Height: approx. 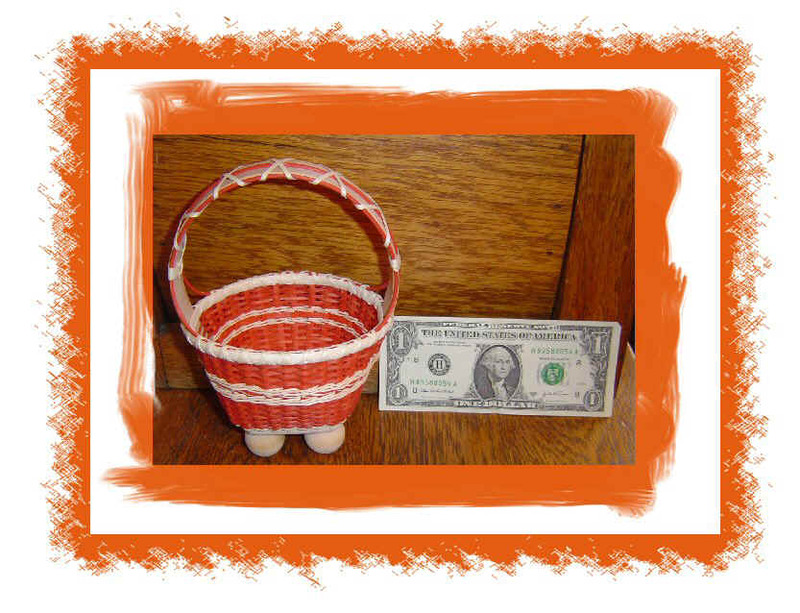 4½"
Base: 7" x 9"/Height 5" approx. 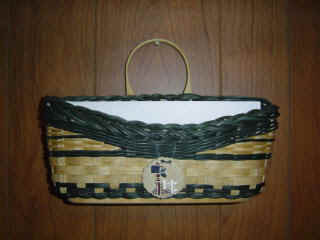 Base: 13" x 21"/Handle Height: 20"
This pattern requires a 12" x 20" rectangular, slotted base, with handle.